We’d love your help. Let us know what’s wrong with this preview of The Consolations of the Forest by Sylvain Tesson. To ask other readers questions about The Consolations of the Forest, please sign up. This is one of those books which I began by enjoying, but which so steadily disappointed and frustrated me throughout that I set it down again after a week with a sense of relief. It’s not awful, and it certainly is diverting — but then any record of a six month stay in a cabin in remote Siberia could hardly fail to provide at least a few good anecdotes. The problem is that the author’s penchant for aphorisms goes beyond a matter of literary style: you begin by thinking that he can’t possibly be This is one of those books which I began by enjoying, but which so steadily disappointed and frustrated me throughout that I set it down again after a week with a sense of relief. It’s not awful, and it certainly is diverting — but then any record of a six month stay in a cabin in remote Siberia could hardly fail to provide at least a few good anecdotes. The problem is that the author’s penchant for aphorisms goes beyond a matter of literary style: you begin by thinking that he can’t possibly believe half of the things he writes here, convinced that at any moment he is about to strike upon something else, something deeper and more insightful in his writing — but that moment of revelation never comes. There’s nothing wrong with what he has to say except that it is all so sadly limited. If I were the editor and this came across my desk after our man had been out on assignment for six months, I’d send him back for six more to have a really good think about himself. To explain: the author is a fairly well-known French travel writer, and the book (in translation) is his record of the time he spent in a tiny one-room cabin on the shores of Lake Baikal in Siberia. It’s a wild, desolate and dangerous place; the lake is vast and deep, one of the biggest in the world, and entirely frozen for part of the year; his temporary home is miles from the nearest neighbour, let alone a town or village of any kind. He lives off pasta and tomato sauce, fish caught from the lake, the occasional cigar and (frankly unbelievable) quantities of vodka. He becomes friends with some of the local fishermen and rangers tasked with monitoring the local outposts of civilisation, many of whom are as eccentric as you’d expect in a book like this. He adopts a couple of dogs and he saunters around the surrounding landscape, thinking his thoughts. He reads a great many books from the enormous (and extremely fine) reading list he’s brought with him. He chops wood. He feeds the fire. He writes. Apparently he also uses the time to make a documentary about himself, but you’d never know that from how he presents himself here. I haven’t seen the film, but I only realised this after a brief Google search brought it up; a camera is mentioned once or twice here, but that’s about it. Perhaps this might not strike every reader as a particularly significant omission — and I don’t really feel it affects the book — but it did strike me as further confirmation of the author’s total lack of self-consciousness in his work. The presence of a camera changes its subject as soon as it is switched on, yet the work that he presumably put into making that documentary doesn’t feature here at all because it isn’t part of the version of himself that he wants to put into the book. Through writing it seems he has attempted to erase and reconstruct his persona into a creature that was somehow born into this world where he is not just another man on holiday, but a new resident, with as much right to be there as the birds and the bears and the fish and the ice and the trees. There’s other stuff that he half-mentions in a way that’s gently infuriating: in his packing list, he mentions bringing various electrical devices, plus solar panels and batteries to charge them, and though he never details what they are, there are occasional mentions of a computer and listening to music (and of course the camera). Whether or not one can listen to music or a radio during six months in the wilderness seems to me just as important as reading — but apparently this merits no clarification. It’s bizarre. Yet the author seems entirely at home, here in this world of his own writing. Frequently his little home is compared to a return to a womb-like environment of perfect security and serenity while the worst of the weather rages outside, and it would be tough not to feel a degree of affinity at this point: after all, one needn’t venture into the wilderness to crave peace of mind. But it turns out that the actual condition of hermitage is integral to the point he is making. The author is convinced that the average hermit is happier and more easily sustained than his brothers and sisters in the city; and not only that, but the hermit is also the only truly revolutionary figure in a political world. In deciding to withdraw their labour from society, the hermit detaches themselves entirely from the greater mass of civilisation, and in doing so develops into what is effectively a better class of person. He must have been referring to a different hermit entirely, because it swiftly becomes clear that the author here remains a product of society and a participant in it, even if he is temporarily allowing himself to pretend otherwise. I have about as much patience with this point of view as I do with the rabid capitalist who insists he owes nothing to the government which built his roads, raised his children, and which will cart him to hospital and put him in the ground when he dies. As it does with all of us, society provided this author with the tools that enable him to survive out on his own: it wrote and printed his supply of books, it fashioned his wooden cabin and his cast-iron stove and his fishing rods and his down jacket and his sleeping bag. And it shaped his mind so finely that he cannot even recognise himself as a product of the world and not of his own imagination. Despite enjoying this book quite a bit, I think it's only fair for me to warn coming readers that Tesson can at times come across more than a little insufferable. Vast quantities of alcohol and self-satisfaction are Tesson's closest companions in his tiny cabin, and while the former makes for entertaining stories, the latter only offers us dull quasi-philosophical rambling. When the intellectual snobbery abates, a few chapters into his stay, the book is delightful. This is Laura Ingalls Wilder in Despite enjoying this book quite a bit, I think it's only fair for me to warn coming readers that Tesson can at times come across more than a little insufferable. Vast quantities of alcohol and self-satisfaction are Tesson's closest companions in his tiny cabin, and while the former makes for entertaining stories, the latter only offers us dull quasi-philosophical rambling. On peut dire que j'ai pris mon temps, que j'ai traîné, que j'ai peiné pour achever ce livre. Mais ça n'est pas sa faute. Au contraire, c'est tout à son mérite que, malgré mon apathie littéraire du moment, je lui sois restée fidèle, y retournant quand l'envie revenait (ajoutons que lu dans le cadre du Club Lecture MS, j'avais aussi une motivation. Et qu'emprunté à la bibliothèque du coin, un impératif). Toujours est-il que Dans Les Forêts de Sibérie nous autorise à prendre son temps à la lecture. On peut dire que j'ai pris mon temps, que j'ai traîné, que j'ai peiné pour achever ce livre. Mais ça n'est pas sa faute. Au contraire, c'est tout à son mérite que, malgré mon apathie littéraire du moment, je lui sois restée fidèle, y retournant quand l'envie revenait (ajoutons que lu dans le cadre du Club Lecture MS, j'avais aussi une motivation. Et qu'emprunté à la bibliothèque du coin, un impératif). Toujours est-il que Dans Les Forêts de Sibérie nous autorise à prendre son temps à la lecture. Ça se déguste, se picore, se relit aussi peut-être. Mis à part ces considérations techniques, ce livre est un plaisir. J'ai entraperçu des paysages somptueux, mais surtout j'ai rencontré un homme. Un homme que je trouve plein de défauts, des défauts aussi graves que le sont ses qualités. Un homme dont les pensées m'inspirent. Mise en abime. L'écriture et le rythme de Tesson semblent suivre le rythme des saisons, le chapitre d'avril est pareil au printemps, annonciateur d'une énergie nouvelle. Difficile de dire ce qui m'a tant plu dans cette lecture. Peut-être que (malgré) son propos éminemment intellectuel, nourri (pourri?) par les auteurs lus et les sentences sur le monde moderne, le livre est aussi une expérience sensible, une œuvre aussi sûre d'elle qu'elle est humble. Sylvain Tesson is never going to be one of my favorite authors, so much is clear to me now. I got angry, last year, after reading his "Sur les chemins noirs" (no English edition yet), because of his misanthropy and cancerous self-pity. This earlier work, "Six months in Siberian forests" is also a diary report, this time of a stay in a log cabin on Lake Bajkal, in Siberia in 2010. This book is more digestible, because Tesson is much more descriptive, and paints the harsh living conditions (especi Sylvain Tesson is never going to be one of my favorite authors, so much is clear to me now. I got angry, last year, after reading his "Sur les chemins noirs" (no English edition yet), because of his misanthropy and cancerous self-pity. This earlier work, "Six months in Siberian forests" is also a diary report, this time of a stay in a log cabin on Lake Bajkal, in Siberia in 2010. This book is more digestible, because Tesson is much more descriptive, and paints the harsh living conditions (especially in the winter) in that region. Occasionally there are charming sketches of the natural beauty of living near and on that massive lake (with the loud sounds of explosion, in the movement of the ice). But once again I was annoyed by his continual attacks on modern civilization and humanity in general, his denigrating statements about other people (he both uplifts and downsets the habits of Russians), and his pathetic self-pity. His diary is filled with very superficial statements of wisdom, with continuous drinking bouts, and rather boring reports of his hiking trips. Several details just don't fit, like the reference to the on-going Arabic Spring (that was a year later!). Also, from his description it is very clear he didn’t really live a hermit's life: he constantly got visits, or went to visit other people in the neighborhood (to drink and exchange very common opinions on life), and – through a computer and camera’s – he had a regular outside line. So it seems to me that Tesson doesn’t live up to the myth he creates himself. Only occasionally he has moments of clear insight in his escapism: What am I? A coward that is terrified of the world and therefore has withdrawn into a log cabin in the forest. A funk who sinks in silence not to see the scenes of the time or to avoid bumping into his conscience as he walks along the shore". Il formato standard della birra siberiana è 3 litri. Durante un viaggio Tesson si fermò sulle rive dei Baikal e decise che prima o poi ci sarebbe tornato. Ci tornò, per sei mesi di solitudine in una capanna di tronchi 3x3: una stufa, due finestre, una porta. Ovviamente con attrezzatura di sacco a pelo, pentole e coltelli e viveri. Soprattutto Tabasco, spaghetti cinesi, sigari cubani, vodka e libri. Fuori tutto e nulla: nulla per un inquilino di un casamento urbano, tutt Il formato standard della birra siberiana è 3 litri. Fuori tutto e nulla: nulla per un inquilino di un casamento urbano, tutto per chi sa vedere. Quante volte abbiamo detto che avremmo avuto bisogno di solitudine, che questa società crea ripulsa, che la natura è meravigliosa? Avere il tempo di ascoltare il silenzio, di camminare nella neve, di scivolare sul ghiaccio, di avere per compagnia un uccellino fuori dalla finestra, dei buoni libri da “leggere” finalmente. Niente orologi, televisione (il massimo che facciamo è dire ah, io non ce l’ho), cellulari, niente giornali, niente notizie. E’ vero che lui il cellulare ce l’ha, ma funzionerà solo una volta. Qualche rara visita di e ai vicini (minimo 25 km nel ghiaccio). In genere guardiani di stazioni meteorologiche o controllo delle regioni di caccia. Personaggi singolari, compagni di cene e sbronze. Solo con la stagione buona qualche turista, francese o tedesco o olandese. Di che parla il libro? E’ il diario di una solitudine appagante e pacifica, che nel respiro della natura trova sufficiente sostentamento alla propria anima. Le giornate trascorrono nella gestione del tempo senza obblighi, se non quelli della sopravvivenza: spaccare legna, pescare, tenere accesa la stufa, scrivere e leggere. E quelli imposti dal sorgere del sole o della luna. Essere eremita per Tesson è una scelta, anche se limitata nel tempo. Molti lettori direbbero “due palle”, altri accuserebbero il narratore di contemplazione del proprio ombelico, altri tremerebbero senza e-book, iphone, ipad, tablet, note book. Chi sogna una crociera è meglio non lo legga. Chi crede che il massimo sia l’avventura di un giovane incosciente alla ricerca del mondo selvaggio, non lo legga. Chi crede che la strada giusta sia Robinson che ricrea sulla sua isola i riti del mondo british, eviti. Chi è astemio, può “sentire” i profumi dell’alcool anche attraverso le pagine e ubriacarsi. Chi non mangia due volte di file le stesse cose, può intristirsi. Gli altri ci possono provare e non rimanere delusi. und findet sie in und um einer Hütte am Baikalsee. wird den Autor um dieses halbe Jahr am Baikalsee beneiden. My book of the year? Quite possibly. If you are intrigued by the idea of living in a hut for six months by a lake in the depths of Siberia then this book is surely for you. Tesson is French and writes extremely well, he took 80 or so books with him (listed in the book), three or four crates of vodka and several large boxes of cigars. Sounds civilised to me. This is Tesson's only book in English, we need more! Je l'ai finalement trouvé moins prétentieux en avançant dans le livre, est-ce l'habitude ou est-ce vraiment le cas, je n'en sais rien. La deuxième partie du roman est tout de même moins laborieuse à lire, mais je n'y ai toujours pas trouvé grand intérêt. J'ai tout de même retenu des réflexions et citations intéressantes, mais noyées dans un tas de mots compliqués et des litres de vodka, elle perdent un peu de leur intérêt. Cette lecture a été pour moi l’une des plus belles de l’année (loin d’être révolue, donc la barre est haute désormais). Je n’attendais pourtant rien en particulier de ce livre et même si j’avais entendu parler de Sylvain Tesson, je n’avais jamais vraiment été tentée de lire ses écrits. Quelle bêtise ! J’ai maintenant envie de découvrir le reste de son œuvre, mais il me faudra une pile d’autres carnets pour consigner toutes les citations inspirantes que j’ai déjà glanées dans Dans Les Forêts de S Cette lecture a été pour moi l’une des plus belles de l’année (loin d’être révolue, donc la barre est haute désormais). Je n’attendais pourtant rien en particulier de ce livre et même si j’avais entendu parler de Sylvain Tesson, je n’avais jamais vraiment été tentée de lire ses écrits. Quelle bêtise ! J’ai maintenant envie de découvrir le reste de son œuvre, mais il me faudra une pile d’autres carnets pour consigner toutes les citations inspirantes que j’ai déjà glanées dans Dans Les Forêts de Sibérie. On pourrait peut-être s’étonner du paradoxe entre la forme du journal intime, tenu au jour le jour, et l’intemporalité des propos. Certains y trouveront un caractère répétitif, mais j’y vois la beauté d’une réflexion qui prend justement tout son sens dans cette immédiateté de l’universel, dans l’imminence d’un destin dont il faut prendre conscience. L’auteur narrateur semble parfois se moquer de la nature même de son projet et de sa propre personne, lorsqu’il s’exclame, revenant aux choses simples et révélant une vision du monde presque animiste, "il y a plus de vérité dans les coups de ma hache et le ricanement des geais que dans les péroraisons psychologiques", mais aussi lorsqu’il pointe du doigt, se comparant à Robinson Crusoé, le risque de développer "un léger syndrome mégalomaniaque" et "le syndrome de la tour d’ivoire." Le seul aspect qui me perturbe (qui n’est pas inhérent au texte, mais au personnage) est que Sylvain Tesson nous répète éprouver ce besoin de se poser, après une vie de baroudeur passée à voyager, à courir après le temps. Pourtant, son livre suivant est un récit de voyage, comme si son expérience érémitique n’avait été qu’une parenthèse et non une profonde remise en question de son quotidien. De plus, sa volonté de tester les limites en permanence, et parfois de manière complètement irréfléchie, a eu raison de lui, ne serait-ce que pour un temps, puisque cela lui a valu un grave accident. Or, à mon humble avis, le récit qu’il nous livre va à l’encontre d’une telle attitude ; l’ascèse aussi bien que l’hédonisme (cf. la vodka) mis en œuvre dans son épreuve solitaire étant des philosophies qui tendent plutôt à la connaissance des limites et à leur évitement au moyen d’un apprentissage ordonné. Néanmoins, ces considérations plutôt périphériques ne remettent pas en question le plaisir que j’ai éprouvé à lire ce superbe livre. Deze stond al een tijdje op me te wachten, en wanneer een vriend van me onlangs een soortgelijk verblijf van drie maanden in het gure Lapland aanvatte leek het een ideaal moment dit reisverslag ter hand te nemen. Tesson besloot om zijn leven in het drukke Parijs zes maanden te verruilen voor een hutje aan het immense Baikalmeer - met zijn 31.500 vierkante kilometer het grootste zoetwaterreservoir ter wereld. Hij wil het kluizenaarschap uittesten: kan hij uit de vluchtigheid van het stedelijke bes Deze stond al een tijdje op me te wachten, en wanneer een vriend van me onlangs een soortgelijk verblijf van drie maanden in het gure Lapland aanvatte leek het een ideaal moment dit reisverslag ter hand te nemen. Living for six months. alone in an isolated cabin in the Siberian Taiga, not sure of the location or the intense cold but living and being alone sounds awfully good at times. The author arrives in February and stays until the end of July, so he deals with the intense cold first, but he has brought plenty of supplies, and plenty of reading material. I found is amusing that the only two contemporary authors on his list were James Ellroy and Michael Connelly, he calls them palette cleansers. The pro Living for six months. alone in an isolated cabin in the Siberian Taiga, not sure of the location or the intense cold but living and being alone sounds awfully good at times. The author arrives in February and stays until the end of July, so he deals with the intense cold first, but he has brought plenty of supplies, and plenty of reading material. I found is amusing that the only two contemporary authors on his list were James Ellroy and Michael Connelly, he calls them palette cleansers. The prose and descriptions are amazingly beautiful. I could have picked quotes out on nearly every page. What he see and experiences, he writes down daily in his journal as well as his thoughts and quotes from other sources, books etc. They were wonderful and he experiences something few people ever will. By book end he almost persuaded me that maybe Siberia would be the place to be alone. Not quite though, I am not that brave. At the end of his six months these were his thoughts. "I came here without knowing whether I'd find the strength to stay; I leave knowing that I will return. I've discovered that living within silence is rejuvenating. The virginity of time is a treasure. The parade of hours is busier than the plowing through of miles. The eye never tires of splendor. The more one knows things, the more beautiful they become." Every time I picked up this book to read I felt a calmness and peacefulness, not many books can do that. L'auteur m'a très rapidement agacée avec ses grands airs. Je lui trouve un air de famille avec Elizabeth Gilbert : tous deux à la recherche d'une forme de transcendance, mais selon moi trop imbus d'eux mêmes pour la trouver avec humilité. Les descriptions de l'auteur de sa propre humilité et de son choix si particulier, si osé (selon ses dires) m'ont fait grincer des dents. Pour être humble, il faut avant tout oublier son nombril. Et arrêter de compter les verres de vodka avalés. Par contre, je s L'auteur m'a très rapidement agacée avec ses grands airs. Je lui trouve un air de famille avec Elizabeth Gilbert : tous deux à la recherche d'une forme de transcendance, mais selon moi trop imbus d'eux mêmes pour la trouver avec humilité. Les descriptions de l'auteur de sa propre humilité et de son choix si particulier, si osé (selon ses dires) m'ont fait grincer des dents. Pour être humble, il faut avant tout oublier son nombril. Et arrêter de compter les verres de vodka avalés. Par contre, je salue le style, tantôt presque télégraphique, tantôt enlevé, qui m'a révélé de belles images et de beaux paysages. Il m'a donné envie de rechercher des photos de la région. J'adore les récits de voyage et d'aventure humaine. Celui-ci est vraiment bien écrit. On ressent parfaitement les sensations d'isolement, de froid, de fatigue et aussi de découverte de soi et d'amitié. Ca donne envie de se lever et de commencer à marcher ! Je me découvre plutôt bon public...j'ai commencé ce roman dans le cadre de la lecture du mois du clublectureMS, et comme je n'avais pas voté pour lui, je n'étais que peu emballée...et c'est au final une agréable découverte ! Le style d'écriture, aux phrases souvent courtes, m'a vraiment plu, et j'ai même lu de longues parties à voix haute, ce qui ne m'arrive JAMAIS ! Je me suis retrouvée dans pas mal des réflexions de l'auteur sur notre vie actuelle, même si je n'arrive toujours pas à comprendre Je me découvre plutôt bon public...j'ai commencé ce roman dans le cadre de la lecture du mois du clublectureMS, et comme je n'avais pas voté pour lui, je n'étais que peu emballée...et c'est au final une agréable découverte ! Le style d'écriture, aux phrases souvent courtes, m'a vraiment plu, et j'ai même lu de longues parties à voix haute, ce qui ne m'arrive JAMAIS ! Sylvain Tesson se lit écrire comme certains s'écouteraient parler. J'ai les mêmes réflexions pseudo-philosophiques quand je m'ennuie, sauf que j'ai le bon goût de ne pas en faire un bouquin à 28€ pièce. Non fiction ascetica sotto forma di diario. Incipit: Mi ero ripromesso che prima dei quarant’anni avrei vissuto da eremita nei boschi. Sono andato a stare per sei mesi in una capanna siberiana, sulla sponda del lago Bajkal, all'estrema punta del capo dei Cedri del Nord. Il primo villaggio e a centoventi chilometri di distanza, non ci sono vicini, nessuna strada di accesso. Di tanto in tanto una visita. D’inverno temperature di meno trenta gradi, d’estate gli orsi in riva al lago. Insomma, un para Non fiction ascetica sotto forma di diario. Sono andato a stare per sei mesi in una capanna siberiana, sulla sponda del lago Bajkal, all'estrema punta del capo dei Cedri del Nord. Il primo villaggio e a centoventi chilometri di distanza, non ci sono vicini, nessuna strada di accesso. Di tanto in tanto una visita. D’inverno temperature di meno trenta gradi, d’estate gli orsi in riva al lago. Insomma, un paradiso. Tranquilli, non è uno di quei libri tipo ho scoperto il senso della vita e lo condivido con voi. Ci sono le riflessioni ma c’è anche parecchia azione. Ci sono i libri da leggere, la legna da spaccare, i pesci da pescare. Le scorribande in kayak, le camminate nella taiga, gli orsi, Ajka e Bek. Temperature siderali, vodka a litri, sigari e pasta al tabasco. Qualche personaggio tipicamente russo, tra il particolare e lo strambo, a fargli compagnia ogni tanto. La primavera che arriva e il paesaggio che cambia. Mi segno qualche citazione. Di frasi belle ce ne sono parecchie. Esperienza invidiabile. E c’è pure il colpo di scena. La inserisco nelle cose da fare tra andare a correre e mangiare meno carboidrati. Il termometro è a -33°. Il camion è sparito nella foschia. Il silenzio scende dal cielo in forma di piccoli fiocchi bianchi. Essere soli significa sentire il silenzio. Una raffica di vento. Il nevischio mi appanna la vista. Lancio un urlo. Spalanco le braccia, offro il viso al vuoto gelido, poi torno al caldo. Ho raggiunto lo scopo della mia vita. Finalmente saprò se ho una vita interiore. A sera nevica ancora. In simili casi il buddhista dice a se stesso «Non aspettiamoci niente di nuovo»; il cristiano «Domani andrà meglio»; il pagano «Che significa tutto questo?»; lo stoico «Vediamo quello che succede»; il nihilista «Seppellisca pure ogni cosa!». Io: «Devo uscire a far legna prima che i tronchi siano del tutto ricoperti». E vado a letto dopo aver messo un altro ceppo nella stufa. Non c’è niente di più bello della solitudine. Per essere completamente felice mi manca solo una cosa: avere qualcuno a cui spiegarlo. Poi, mentre la luce si affanna ad aprire sempre nuovi varchi tra le nuvole, mi allungo sulla spiaggia davanti a un fuoco di legna, con i cani sdraiati contro il mio fianco e il kayak tirato in secco per metà. Ascolto la musica delle onde, guardo i pesci che si arrostiscono infilzati su spiedini di legno verde e penso che la vita dovrebbe essere solo questo: un omaggio reso da un adulto ai suoi sogni di bambino. Lotto contro la tentazione di scattare una fotografia. This was a book that you couldn''t read in one attempt. It took me weeks to finish it, but it wasn't a bad book at all. Just a book with a difficult access. The author lived for 6 months as a hermit at the Bajkal Lake in Siberia and these are his memoires about his stay in the forest at the Balkan Lake. It's a mainly philosophivcal book, because of the insights on life. Sometimes the author writes his thoughts down and give you, as the reader, food for thought, which is a surplus for this book. The This was a book that you couldn''t read in one attempt. It took me weeks to finish it, but it wasn't a bad book at all. Just a book with a difficult access. The only thing a found less in this book, is a bit the romantic view of living is a hermit. Tesson has access to the normal world with his satelite Phone, he has a computer and on regular basis he drinks liters of wodka with friends. In my point of view, living as a hermit, is having limited access with the normal world, not having devices to communicate with the normal world (only in case of life and death) and be fully self providing. Tesson has a desire for freedom and solitude, and decides on a whim to take himself off to the shore of Lake Baikal, to stay in a 3 metre square log cabin, a six day hike from the nearest village. From February to July of that year he inhabits that small cabin, built many years previously by geologists it has a small cast iron stove and very primitive facilities. When he arrives in February he is in the middle of the brutal Siberian winter, and sets about gathering wood to warm the cabin. 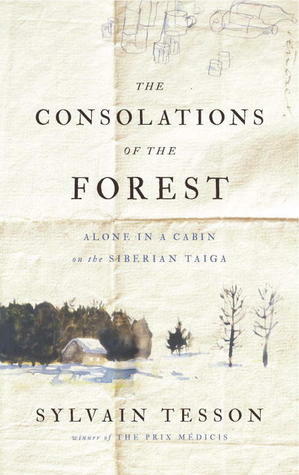 Each d Tesson has a desire for freedom and solitude, and decides on a whim to take himself off to the shore of Lake Baikal, to stay in a 3 metre square log cabin, a six day hike from the nearest village. From February to July of that year he inhabits that small cabin, built many years previously by geologists it has a small cast iron stove and very primitive facilities. When he arrives in February he is in the middle of the brutal Siberian winter, and sets about gathering wood to warm the cabin. Each day is a challenge when he thinks about his solitude, but he starts a routine of collecting fuel, and taking time to smoke and read in the mornings, fishing and exploring his local environment. It is written as a diary, with entries for most days describing what he did, what he drank and where he walked to. He has a regular stream of visitors that pop in for short visits and he also goes and see others in the locality in similar cabins to him. He takes time to explore the landscape too, climbing up on to the ridges, crossing the frozen lake and kayaking on it when it has thawed. He writes about the wildlife he sees, in particular the bears the wolves and the seal native to the lake. In his moments of solitude he describes how he feels being utterly alone. He has dark disturbing moments, and times when he has utter clarity of his emotions. He gives a kit list at the beginning, including the books that he took. Some provided comfort, others rattled him whilst alone. It is beautifully written too, with moments of philosophy and insight that being alone with your thoughts can bring. Maybe I'm not able to enter properly into the spirit of the book, but personally I would have preferred a stronger accent on the environmental side of the description than the intimate one. Also I do not understand the surprise and disappointment felt by the author when it arrives the message of the girlfriend when she leaves him. What did he expect? As stated in the quote at the beginning of the book: "Freedom is always there. Simply pay the price.". Did you wanted six months as a hermit on Bai Maybe I'm not able to enter properly into the spirit of the book, but personally I would have preferred a stronger accent on the environmental side of the description than the intimate one. Tesson travels to Lake Baikal in Siberia to be a hermit, to escape fifteen kinds of ketchup in the supermarket, endless phonecalls and emails, superficial conversations, and deluge of people squished against each other in Paris and other cities. But I'm skeptical of the Man Alone in Nature and Cities Are Rotten narratives. On the contrary, I think cosmopolitan cultures force people to accept difference and tolerance—as long as they're actually forced to smash up against the other without comforta Tesson travels to Lake Baikal in Siberia to be a hermit, to escape fifteen kinds of ketchup in the supermarket, endless phonecalls and emails, superficial conversations, and deluge of people squished against each other in Paris and other cities. But I'm skeptical of the Man Alone in Nature and Cities Are Rotten narratives. On the contrary, I think cosmopolitan cultures force people to accept difference and tolerance—as long as they're actually forced to smash up against the other without comfortable walls keeping them apart. "How did kitsch take over the world? The principal phenomenon of globalization has been a worldwide embrace of the ugly. ... Bad taste is the common denominator of humanity. ... I am the bourgeois defending the superiority of a parquet floor over linoleum. ... Aestheticism is a form of reactionary deviance." And that gets at the heart of my complaint. Like Thoreau, Tesson barges into a poor foreign "untrammeled" area and basically buys his way in. He makes a choice to abandon civilization, whereas most of his neighbors never had that choice. Anyway, my complaint is more on the privileged in general. He constantly claims superiority over radicals and others engaged in the world and that the "true" response would be to abandon The System completely. But how many people can follow him? And if everyone did, then his untrammeled wonderland would be clogged by an endless waves of wannabe hermits. Ultimately, Man Alone in Nature is only a choice for the privileged and is ultimately a selfish move, unless, of course, it is unlike Thoreau and Tesson and the Man Alone in Nature stays in nature (or you know, seriously, just kill yourself, that seem pretty reasonable to me). The book is beautiful, though. Filled with light ruminations on the books he's reading, the thoughts he's experiencing, and recording the endless small permutations of natural phenomenon. It also takes a sudden dive into heartbreak, which was unexpected and oddly glossed over, but yeah, I've cried into my cat's fur, and his way of describing that, and describing the way that his pets "saved his life" is pretty amazing. The potentially fascinating experience of a French dude living as a hermit in the Siberian wilderness, that turns out to be a superficial and inauthentic story due to his pretentious writing style and general snobbery. Het idee: om los te komen van zijn drukke, jachtige leven in Parijs, gaat Sylvain Tesson 6 maanden leven in een blokhut aan het Baikalmeer in Siberië. Van februari tot en met juli, dus de winter en voorjaar. Van zijn verblijf daar houdt hij een dagboek bij. Als hij is gedropt bij zijn blokhut, na een tocht met een vrachtauto over het bevroren meer, en hij alleen achterblijft, stelt hij: Eindelijk zal ik weten of ik een innerlijk leven heb. Wat volgt is een verslag waarin heel veel sneeuw en ijs vo Het idee: om los te komen van zijn drukke, jachtige leven in Parijs, gaat Sylvain Tesson 6 maanden leven in een blokhut aan het Baikalmeer in Siberië. Van februari tot en met juli, dus de winter en voorjaar. Van zijn verblijf daar houdt hij een dagboek bij. Wat volgt is een verslag waarin heel veel sneeuw en ijs voorkomt, heel veel beklimmingen van besneeuwde berghellingen, en afdalingen van besneeuwde berghellingen enzovoorts en enzovoorts. Verder beschrijft hij alle dagelijkse werkzaamheden, zoals houthakken, vissen, water halen (niet eenvoudig met een meer met een ijslaag van ruim een meter). Tesson schrijft met zowel vaart, als humor, als poëtisch vermogen, dus saai wordt het nooit. Bovendien leest hij, boeken van uiteenlopende schrijvers, zoals Schopenhauer, Nietzsche, Heidegger, Kierkegaard, D.H. Lawrence, Casanova, Daniel Defoe, Conrad, Chateaubriand, Camus, Michel Tournier, om een greep te doen. Met de inspiratie die hij uit deze boek opdoet, lardeert hij zijn dagboek. En hij drinkt. Alleen, of als er bezoekers zijn (wat geregeld voorkomt) of als hij ergens op bezoek gaat (wat ook geregeld voorkomt). De lezer krijgt bijna levercirrose van alle vodka die daarbij naar binnen wordt gegoten. Vodka is niet het enige wat de Russen in Siberië op de been houdt; over het leven daar in Siberië pik je als lezer ook nog het een en ander mee. Tessons verslag neemt je als lezer mee naar de basale essenties van het leven: eten, drinken - en daarvoor zorgen, vuur, een warme plek om te slapen. Wie zich verwondert over de overdaad bij ons in het westen, is bij dit boek aan het goede adres, en zal zich nog meer verwonderen na lezing ervan. Je krijgt bijna zelf zin om in een blokhut aan het Baikalmeer te gaan wonen. Een vrij mens is de baas over de tijd. Wie de ruimte beheerst is machtig, meer niet. Ik zal nooit meer schamper doen over mensen die praten over de regen of het mooie weer. Iedere beschouwing over het weer heeft een kosmische dimensie. Het is geen minder diepzinnig onderwerp dan een discussie over de infiltratie van de salafisten in de Pakistaanse inlichtingendienst. Onbeduidende voorvallen zijn hele belevenissen als je in het bos woont. Ik zit erop te wachten, ik kijk ernaar uit. Als ze zich voordoen, herken ik ze, begroet ik ze. Geluk wordt zo simpel als dit: wachten op iets waarvan je weet dat het gaat gebeuren. Je hebt meer aan boeken dan aan therapie. Alles staat erin, meer dan in het leven. Ze vormen een perfecte mix van psychofarmaca voor eenzaamheid in combinatie met het leven in een blokhut. Sylvain Tesson est le fils de Marie-Claude et Philippe Tesson et le frère de la comédienne Stéphanie Tesson et de la journaliste d'art Daphné Tesson. Géographe de formation, il effectue en 1993 un tour du monde à bicyclette avec Alexandre Poussin avec qui il traverse l'Himalaya à pied en 1997. Il traverse également les steppes d'Asie centrale à cheval avec la photographe et compagne Priscilla Telmo Sylvain Tesson est le fils de Marie-Claude et Philippe Tesson et le frère de la comédienne Stéphanie Tesson et de la journaliste d'art Daphné Tesson. Géographe de formation, il effectue en 1993 un tour du monde à bicyclette avec Alexandre Poussin avec qui il traverse l'Himalaya à pied en 1997. Il traverse également les steppes d'Asie centrale à cheval avec la photographe et compagne Priscilla Telmon, sur plus de 3 000 km du Kazakhstan à l'Ouzbékistan. En 2004, il reprend l'itinéraire des évadés du goulag en suivant le récit de Sławomir Rawicz : The Long Walk (1955)1. Ce périple l'emmène de la Sibérie jusqu'en Inde à pied. Sylvain était également un « escaladeur de cathédrales » et au sein d'un cercle d'acrobates on le surnommait « le prince des chats », tandis qu'il escaladait Notre-Dame de Paris, le Mont-Saint-Michel, l'église Sainte Clotilde et d'autres monuments (principalement des églises) à Orléans, Argentan, Reims, Amiens ou encore Anvers. En 2010, après avoir fait allusion à ce projet de nombreuses fois, Sylvain Tesson passe six mois en ermite dans une cabane au sud de la Sibérie, sur les bords du lac Baïkal, non loin d'Irkoutsk. Selon ses propres dires : « Recette du bonheur : une fenêtre sur le Baïkal, une table devant la fenêtre ». Il voyage la plupart du temps par ses propres moyens, c'est-à-dire sans le soutien de la technique moderne, en totale autonomie. Ses expéditions sont financées par la réalisation de documentaires, par des cycles de conférences et par la vente de ses récits d'expédition. Il obtient le prix Goncourt de la Nouvelle en 2009, pour Une vie à coucher dehors (éditions Gallimard, 2009) et le prix Médicis essai en 2011 pour Dans les forêts de Sibérie.